Form W-1 KJDA or the "Employers Quarterly Return Of Occupational License Fees Withheld Claiming The Kentucky Jobs Development Authority Credit" is a form issued by the Kentucky Department of Revenue. 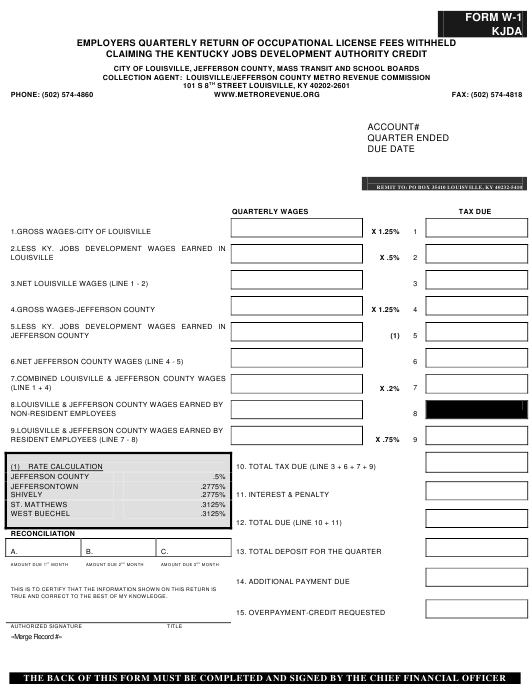 Download a PDF version of the latest Form W-1 KJDA down below or find it on the Kentucky Department of Revenue Forms website. TRUE AND CORRECT TO THE BEST OF MY KNOWLEDGE. of this form was $____________________ . state inducement as a credit on its corporate income tax is $______________________. first page of this form is $_____________________. number of employees at the end of the quarter indicated on the first page of this form is ____________. of KRS 154.24-010 (16) and was the activity as described at the time the KJDA project was approved. from all other receipts of the licensee. the best of my knowledge and that this company has met the requirements of the KJDA project.